Before returning home after the walk, Wendy and I spent three weeks travelling through Southern Africa visiting some of the projects that we have funded in the past and learning more about the methodology being used in the projects that were funded this year thanks to your support. In total we travelled 7,600km through 5 countries and visited 11 community groups. It was an exhausting but very rewarding three weeks. It would take me 10 pages to share with you the experiences of all our projects so I will just share with you a summary of a couple of villages as examples of what we saw across all our visits. 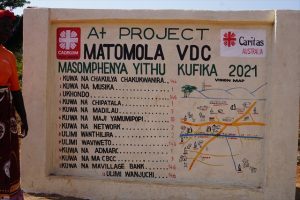 In Malawi we visited 4 villages who are all part of the Integrated Community Development Program coordinated by Caritas Australia. One of those villages was Matomola, north of Mzuzu in northern Malawi, near the town of Rumphi. We met the Caritas coordinator at the turn off to the village and then drove 30km on a windy, hilly and bumpy dirt road to reach the village. As soon as we got to the village we were greeted by a group of school children singing and dancing which was an amazing sight. They have a large brick wall at the entrance to the village which has been painted with their community vision which the community leaders were keen to explain to us, through an interpreter of course. Their vision for the next five years was for food security, improved access to water & sanitation in each home, mobile network coverage, better irrigation for their crops, improved access to education and a hospital. It is great to see just how proud they are of the progress they are making towards a more prosperous future. Caritas facilitates community workshops to help them map out their vision, the resources they have available and where they need assistance or support. This is called the Strengths Based Approach and differs from their previous Needs Based Approach that focussed on asking a community only what they needed. With SBA the community is fully involved in every step of the process and take ownership of the outputs in the long term. We were shown several households that had recently had toilets, handwashing stations, dish drying racks and clotheslines installed. The owners were so proud to show us how they can now wash their hands straight after going to the toilet by using the tippy-tap setup. Its such a simple thing but has a huge impact. 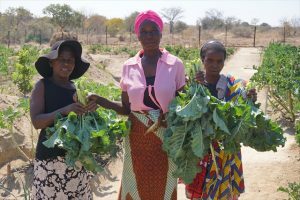 In Zimbabwe we visited several communities that have seen an increase in prosperity through a range of initiatives that are based around the creation of a community nutritional garden. 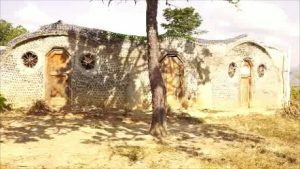 Caritas assisted them to fence the gardens to protect it from wildlife and construct a toilet within each garden but the community themselves provided all the labour including construction of the vegetable plots with guidance from a Government Agricultural Officer who is based in the area. A bore has also been drilled which is operated by manual pump in most of the gardens however in the garden that is used by the elderly and disabled, funding provided by Caritas has been used to connect the bore to a solar powered pump which pumps water to a water tank and can then be accessed via three taps inside the vegetable garden itself. Two committees have been formed within the community to oversee these projects and ensure that they are run properly now and in the future. The members of the committee all get training on how to run a committee and the various roles involved and also on the various maintenance tasks that are required to look after the projects once they are complete. Supporting all these initiatives is training on community ownership, crop rotation, nutritional value of various fruits & vegetables, how to cook new vegetables being grown, how to turn surplus of things like lemons into produce that can be sold such as marmalade, marketing and record keeping for surplus being sold as well as training on domestic violence and child protection. The improvement in livelihoods and general confidence within the community is clearly visible when you talk to the community. One lady even said “Thanks to Caritas, we are not poor any more!” and another asked us to keep supporting Caritas so more villages can benefit from their projects. It was amazing that they now have hope for the future and know how to continue to improve their lives on their own. They weren’t asking for more for themselves, just that others can have the same opportunity. It was great to be able to go back to the community of Kapita in central Malawi and see the results of Empower’s 5 year project in the area. Wendy and I first visited this community in 2013 when we were part of an international volunteer team that helped build the first few rooms of a community centre using a sustainable architecture design called an Earthship. Since then the community has finished the outer structure of the remaining rooms. The completed rooms are being used as a community bank, a nursery and a store room. Unfortuntately as it was school holidays we were not able to see the nursery but we have followed its progress since being established a few years ago as the initial start up capital required was provided by us through funds raised at our Charity Garage Sales. It is great to know that with a little bit of help to cover the cost of training teachers and some initial equipment this nursery school is now fully community owned and operated on a sustainable basis through charging of a small weekly fee to parents. We also visited the Kapita school where again funds from the Charity Garage Sales were used to construct some composting toilets. Never thought we would find toilets so fascinating but it is great to see how they improve sanitation whilst also providing quality organic manure for the permaculture garden that surrounds the school. Along with a rain water harvesting system that enables them to store water during the wet season and extend the growing period of fruits and vegetables in the dry season, the school is now able to provide a nutritious meal to the students on a regular basis. The final project we visited in Malawi was the Timbiri Community SACCO, a savings and loan institution setup to provide locals with access to affordable savings and loan facilities (similar to a member based credit union or bank here in Australia). By becoming members the local community are able to save for future needs and also have access to short term loans that allow them to expand their businesses. We met one lady who ran a local general store but wanted to improve her income by breeding chickens so took out a loan from the SACCO. She was able to repay the loan with the proceeds from the chickens and now is saving up to expand to also breeding chickens for egg production as well as meat. The SACCO also provides business advice and support to help local farmers find markets for their produce and to form cooperatives for better outcomes.